One evening, you’re out walking the dogs around the block and you find a dusty old-time, oil lamp that someone has set out by the curb. It’s beautiful! And you can’t imagine why they are throwing it away. So you take it home and polish it up… but when you start rubbing it, a genie appears! Sounds crazy, doesn’t it? But oddly enough, that’s a question I get asked A LOT from my clients and students. So if you have ever found yourself wondering that, you’re not alone. In this episode, I share my insights and experiences on why so many people have this problem and what you can do about it. After watching, read my ‘notes’ below the video and then scroll to the bottom of the page to leave a comment.Or, scroll to the bottom of the page to read the transcript. So the next time you stumble across Aladdin’s Lamp, don’t second-guess yourself! Don’t try and figure out what the optimum three wishes are, or if you can ‘game the system’ somehow and get more than three wishes – or any of the other mind games that can spin you around until you aren’t sure what you want. Even if you DON’T find Aladdin’s Lamp, the first step is always to be honest with yourself about what you really want in life – and then OWN the fact that you’re already clear about what it is that you want. If you already sense what your purpose in life is, don’t psych yourself out. Don’t settle for less just because other people tell you it’s not possible. That’s just one more voice telling you to settle. But really, it’s an excuse for you to put off taking action. How often that happens! We’re given a once-in-a-lifetime opportunity and, instead of taking that leap and going for it… we hesitate. 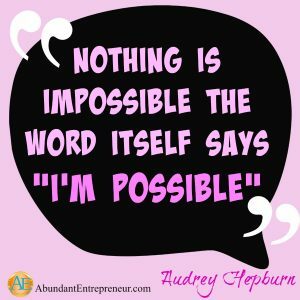 Because remember… after all, everyone says it’s not possible. And, you know… for them, maybe it’s NOT. Be strong. Honest about what it is that you want. And go for it! Got a minute to share your thoughts or dreams? Please leave a comment below. We’d love to hear them. One of the great things about a community like this is that we can share in each other’s dreams and piggy-back on one another’s experiences. You can find inspiration anywhere. And BE inspiration everywhere. As always, we want to thank you for being part of the conversation – whether reading, watching or listening. We appreciate that everyone chooses to participate differently and we celebrate the uniqueness of the way that you choose to participate with us. Want to read the transcript? Click here. This video was for me. I do have I don’t know what I want syndrome. I’ve been asking myself if you couldn’t fail what would you do but I keep ordering the cookies when I really wants ark chocolate pretzels! I really love your videos thank you so much!!! Got to keep working on it! You are totally spot-on with the first part of this video. Great insight. I DO know what I want, I just haven’t been successful manifesting it yet. But the “answer” in the video wasn’t really helpful, as I already do keep going for what I want, however since it still doesn’t show up I still need to choose between the things that HAVE shown up (the “leftovers”) or I have nothing at all while I wait for what I really want (which I may or may not ever be able to make happen!) It’s that old “bird in the hand” deal. Hi Donna! Thanks for the feedback. My suggestion? Don’t wait. Take action now on whichever option gives you the feeling closest to what you really want. Really dive into that feeling! That will set up a vibration that is more aligned with what you want and allow room to open for it to appear. Usually, it’s the feeling we’re really after rather than a specific thing. Hi nice lady, this is good video, I think I know what I want and then think its not possible. Then I don’t know for sure what I want. I am so mixed up , was great advice , thank you. Hi Diane. It’s OK if what you want changes! In fact, you can expect that. Just take advantage of those moments when you get an insight into what you want and take action on it. Taking action will move you forward, but also help define and clarify what you really want. This resonated with me so much! I’m ready for a change in my life, wanting something different, but then stuck in the I don’t know what I want phase for more than a year! I kept thinking my ‘what I want’ has to be perfect and forever, instead of what do I want right now and be ok that maybe in 5 years (or 2 or 10) it’s totally different. EXACTLY, Jennifer! It doesn’t have to be perfect right now. And it’s not forever. Take action today, and let it unfold knowing that it WILL change. You’ll be more able to recognize what you want and it’s easier to re-direct an object in motion so the easiest way to begin is with something small — just to get the ball rolling. Unfortunately, many folks envision the results that they wish to achieve as opposed to the activity to achieve them. For instance, a man or woman may want to be a millionaire. Or, they may simply wish to achieve X dollars of additional income each month. This then is their “hidden goal”. Rather, I would suggest that the “activity goal” might be to have ten thousand internet users who like their blog. Then, it moves to twenty-five thousand viewers who sign on. And hopefully, it improves from there. A person may then develop a paying subscription base. Over time, they will meet their “hidden goal,” one that equates to the results they envisioned that over time derived from the activities to arrive there. You raise several great points, Bob! First, hardly anyone’s vision will include the “effort” put in. It’s all about the results. Not just with a career, but with anything. And as far as the “want” goes, that’s OK. Just to get an idea of what it is you really want if you take practicality off the table. But that’s why I’m always saying to find your PASSION… because then any effort becomes a joy instead of a drudgery. The second point you raise is to break down what you want into bite-size chunks. If your big dream is to be President, then yeah, first you may need to graduate high school. But the big dream gives you motivation to keep going. Sabrina, this is Lola! Love. I met you at Christy Whitman’s QSB in San Diego this past weekend, and you were one of Christy’s fabulous friends. I loved your presentation on how to shoot a video that presents the real, dynamic and professional you. Your video I just watched was awesome. You have such a relaxing and friendly essence on screen that I was receptive and I resonated with every thing that you said. Your message reinforced my belief and the message of Christy’s QSB weekend seminar “Align and then Momentum.” Get still and get clear about what it is that I truly want, once I’m clear about what I want, taking action on what I want becomes organic and authentic. Thank you for the reminder. You are awesome! Loved this video — hit the nail right on the head — thank you Sabrina! I have a question though. I already know what I want. I visualize on it everyday. I have affirmations of it all throughout the day. Question is, how would I know if I’ am on the right track achieving what I want? There are days that I get sidetrack with my goals then I try to get back on track then suddenly get sidetracked again. There is an inkling that I should give up, but not on this dream. Because once I achieve this dream it will be the beginning of something big for me. I need advice from you and the whole community. I want to know if I’ am on the right track in achieving my goal. I want to know, am I the only one experiencing this? Thank you and I look forward in everybody’s advice. Hi Michael! Many people have that question, so thank you for asking! You KNOW you’re on the right track when things (people, places and situations) pop up that are in alignment with where you want to go. It will FEEL good. The emotional charge will “feel” happy and uplifted. I suggest shifting to thoughts and feelings of KNOWING that you are on the RIGHT track. We want to emotionally “charge” that thought with the “feelings” of accomplishment. FEEL what it will be like when you have accomplished this goal (feel it in your body, and perhaps even talk about it. Say it out loud. Say things like “I knew this was going to happen! This is amazing –it’s exactly what I want!). Then hold that feeling throughout the day as much as possible. And return to that feeling whenever you are questioning if you are on the right track. Know like you know like you know – and the quantum field (or the universe) has no choice but to reflect it right back to you. OMG! This is so familiar to me! I’m in that situation right now. It seems something silly, but not knowing what you really want happens quite often. Thanks so much for this video!! I liked the restauraant story Sabrina – perfectly captured the dilemma I see I have as a perfectionist! Changed my order to what i want now. Thank you , as so many have said you nailed it ! I think I’m deserving one minute and completely the opposite the next. Hi sabrina. I liked your diction so clear for a Mexican woman to follow. On the way to be retired, and planning what I want to do in this new stage of my life, you are right ,, body changes like itching you sAid. I had not made the connection of the this change with being sleepy and tired. With your explanation, I really got clarity.!!! I think I am in the right way, before the change happens, I started visualizing how happy and satisfied I will be doing something different. Again you are right, the second steps demands courage, which I prefer to work now that I still have a job, than wait. I decided to start dancing lessons now, to help my body with this change ahead in February. Blessings and continuous evolution for you and your community in 2017! Thank you for saying that! It sounds like you’ve found some clarity and you’re on the right track. So happy for you! Thank you, Sabrina. This serves as a wake-up call for my choices. Beautiful job Sabrina! I have a lovely friend who taught me all of this back in 1996 (read The Power of Oneness by Sandra Brossman Bezar). I completely manifested a new life and a new career. Now I am 60 and facing some physical challenges. And, it is time to manifest something new and different. The challenge has been clarifying what it is that I really want. So, back to the drawing board. It is time to meditate and create some “vision” statements! Thanks for your bright and refreshing perspective! You are perfectly Right On with what you are communicating! I am sharing your information with my son and some other dear friends who are ready to manifest something new and beautiful in their lives! I am looking forward to “finding my passion” once again! Hi Karyn! Thank you so much for taking a moment to share your heart and journey with us. 🙂 And that book sounds great. I’m going to add it to my ever-growing “to be read” list. Thanks! Gratitude tears are the best, aren’t they? 🙂 Thank you so much for sharing your experience with us. Oh my! What a concept! Just dream it anyway! I just watched Ms. Ledwell’s SSEI webinar & have visualized w/it for 3 consecutive days. How perfectly this fits w/that! Thank you! Thanks Sabrina, for helping me understand why I’m not getting clarity in understanding what I want in life. Sometimes I do but then I cant seem to understand how that’s going to be possible and then being afraid that if I pursue my dream then I wont have enough time to give attention to my home and my 9 year old daughter and then something bad may happen if I’m not giving the attention and love my daughter needs,like she may get into bad company and start going in the wrong direction, so this stops me right in my tracks and then my mind wont go further to try and understand and figure out clearly what I want. I love my daughter but that itch to do something meaningful with my life is also uncontrollable and I end up feeling frustrated. Please suggest what I can do. that was fantastic! i have not wanted anything for years–translation, Im afraid to even think about what i might want. your restaurant example was perfect.. i thought my choices of what i could have were so unappealing I told myself i didnt want anything… I DO WANT SOMETHING! I want alot! and now im motivated to do the work to get it. THANK YOU Youve got a new follower. So excited for you! That’s when the true magic starts. You’re not alone. Many people are in the same place. Don’t be afraid to want something. (or a lot 🙂 ) Listen to that! Allow yourself to be guided by it. Thank you Sabrina for putting this out. I thought there was something amiss with me, for not having a great dream and passion until you came up with the story of the waitress. I will send her on her way and go to a different restaurant! Now that made me laugh, Margaretha! Thanks for that. 🙂 You send her on her way. Sabrina, this was wonderful! Thank you! And the Audrey Hepburn quote, don’t think you knew that some very good friends call me Sabrina! (And I love it. Came from Charlie’s Angels, but for me it’s Hepburn!) ❤️✨ And you? Nice uplifting video to see at a very difficult time in my life in the early hours of the morning when I woke and was checking emails. Excellent way to put it, it really clears and put into perspective just what the answer is. I have struggled this way for quite some time, it’s amazing to realize the answer is really truly doable. This will be a life changer! Thank you so much! I do know and I will not fear, just feel confidence and know I’m on the right track!